“At this time” indicates that it was during prayer (again, presumably for the coming of the Holy Spirit) that Peter stood up and spoke the words that follow. I believe that this is a significant thing to note as it is indicative of Peter’s state of mind when he spoke these words. His mind was concentrated and focused on God (he was in prayer after all) when he spoke these words. Thus we can be confident that the words he spoke were of God, and not of himself. The point of vv. 18-19 in this account is to inform the readers about Judas’ fate as this is left out of Luke’s gospel. I will briefly mention that vv. 18-19 do not align exactly with Matthew’s account of Judas’ death; Matthew 27.5 simply says that Judas went out and hanged himself. An exhaustive attempt at reconciling these accounts is not something I wish to do, so I will simply say that they can be reconciled this way: Judas went out and hanged himself over a cliff and after he had been hanging for some time the branch broke and when he fell his intestines burst open. The accounts do agree however that the field became known as the “Field of Blood” (Matt. 27.8). Going back to v. 16 Peter says “the Scripture had to be fulfilled” and then in v. 20 he quotes two separate passages from the Psalms. The first, “Let his homestead be made desolate, And let no one dwell in it,” is from Psalm 69.25. The second, “And let another man take his office” is from Psalm 109.8. Both of these Psalms are describing someone who has been betrayed by those to whom he has shown nothing but kindness and is suffering as a result. By betraying Jesus and delivering him into the hands of the chief priests Judas fulfilled these passages by living out the actions described of the betrayers; he caused an innocent man to suffer harm. Peter then is quoting these passages not to say that these Psalms are predicting Judas’ betrayal of Jesus, but rather to say what should happen to Judas as a result of his betrayal of an innocent man. The first thing that Peter says needs to be fulfilled is: “Let his homestead be made desolate…”; this is essentially asking for someone’s destruction. This “destruction” could be the loss of everything he has worked for his entire life, such as in the case of Job, or it could include the loss of his life. Judas fulfilled this by taking his own life. The second thing that Peter says needs to be fulfilled is: “Let another man take his office.” This has not yet been fulfilled at this point in the account, thus Peter is calling those who have gathered to pray to take up this task of selecting someone to take Judas’ place. 21 Therefore it is necessary that of the men who have accompanied us all the time that the Lord Jesus went in and out among us— 22 beginning with the baptism of John until the day that He was taken up from us—one of these must become a witness with us of His resurrection.” 23 So they put forward two men, Joseph called Barsabbas (who was also called Justus), and Matthias. 24 And they prayed and said, “You, Lord, who know the hearts of all men, show which one of these two You have chosen 25 to occupy this ministry and apostleship from which Judas turned aside to go to his own place.” 26 And they drew lots for them, and the lot fell to Matthias; and he was added to the eleven apostles. Peter specifies two criteria that must be met for Judas’ replacement: 1) he must be a man, and 2) he must have been with disciples during the entirety of Jesus’ earthly ministry (this started with Jesus’ baptism by John and ended with his ascension). Peter’s prayer in vv. 24-25 before they draw lots indicates that it is Jesus who revealed to Peter that someone should be selected to occupy the office that Judas left vacant following his death. Then they draw lots and Matthias is selected and added to the eleven apostles. After reading this passage I ask myself: “Why did someone have to be selected for Judas’ vacant office before the coming of the Holy Spirit?” Or in other words, “Why is this event significant enough to be recorded in Scripture?” It is evident that Peter was directed by Jesus to select a replacement for Judas’ office, but why I cannot say. Perhaps the best explanation I can offer (I emphasize that this is just my opinion) at this point is that since there were twelve tribes of Israel and it was important that no tribe lost its inheritance in the Promised Land (pre-exile of course), so it was important that of the twelve appointed apostles no one lose his inheritance. Since Judas lost his inheritance with his suicide someone then had to be appointed to replace him and receive his inheritance. I’ll avoid going into more detail regarding this for now so this post doesn’t get too long, but if a further explanation is necessary I will be glad to provide it. Before we move on let’s recap what has happened so far. The author has told us this is a continuation of his “first account,” which we identified to be the Gospel of Luke. Thus Luke-Acts is best read as one continuous book. He begins the second account by telling of Jesus’ ascension and that he (Jesus) commands his disciples to go into the city and wait for the Holy Spirit to come. Thus the expectation going into this account is that the Holy Spirit is going to be featured prominently. But before the Holy Spirit comes Peter is directed by Jesus, while in prayer, to select someone to replace the office that Judas left vacant with his death, and that for some reason it was necessary for someone to replace Judas before the Holy Spirit was bestowed. Up next, the coming of the Holy Spirit. Finally. This entry was posted in Acts of the Apostles, Bible and tagged Acts, Acts of the Apostles, Bible, book of Acts, Christianity, God, Jesus, religion, theology on June 30, 2013 by SRQTom. If you get a little angry when television programs delay the part you’ve been waiting to see after having just advertised it, you may feel the same way about this next passage. The previous passage (1.1-11) left us with the expectation that the Holy Spirit was going to come, but this next passage does not contain that event. Instead the author has decided to tell us of the decision to fill the office that Judas Iscariot left abandoned following his suicide. This post will focus on vv. 12-14 as it provides an opportunity to teach a very important lesson concerning prayer. The next post will finish the passage with vv. 15-26. 12 Then they returned to Jerusalem from the mount called Olivet, which is near Jerusalem, a Sabbath day’s journey away. 13 When they had entered the city, they went up to the upper room where they were staying; that is, Peter and John and James and Andrew, Philip and Thomas, Bartholomew and Matthew, James the son of Alphaeus, and Simon the Zealot, and Judas the son of James. 14 These all with one mind were continually devoting themselves to prayer, along with the women, and Mary the mother of Jesus, and with His brothers. Following Jesus’ ascension they leave the place where it occurred, Mt. Olivet, and went back to Jerusalem to the room where they were staying and devoted themselves to prayer. This is in accordance with Jesus’ command in 1.4. The author also pauses here to tell us that there were more present and praying than just the Apostles. While the exact identity of the women present here is unknown I will point out that several women are mentioned in Luke’s gospel as having either accompanied Jesus or provided for him during his ministry: Mary Magdalene, Joanna (Herod Antipas’ household manager), and Susanna (see Luke 8.1-3). Jesus’ mother and His brothers were also present. The word translated “brothers” in this verse is adelphos. It can refer to physical brothers, but it is also translated “brothers and sisters” and is translated as “brethren” in the following verse. In the next verse we find out that the total number of people gathered and devoting themselves to prayer was around 120. There aren’t “right” or “wrong” ways to pray, but I do think there are profitable and and non-profitable ways to pray. I often see prayer described as “bringing your requests before God,” but what I don’t often see described is what these requests should be. I have found not knowing what to pray for to be quite detrimental to my personal spiritual life, and I imagine it has had the same effect on others as well. We can certainly pray for things like a spouse, a new job, a baby, healing for a friend or family member, etc, but if we only pray for these things our thoughts will be primarily focused on these requests being granted and we will feel disappointed and angry with God should they not be granted. These are not bad things to pray for, but they should not be the only things that we pray for, nor should they be the primary things that we pray for. If our prayers are focused on these things God becomes a divine cosmic genie whose sole purpose is to give us what we want, rather than the purifier and sanctifier of our souls. Instead, I believe, that our prayers should be primarily focused and concerned with requests that will make us more like Christ. This is the goal of the Christian life while on Earth after all, at least to the extent that it is possible to achieve in a Fallen world. I’ve found that praying written prayers everyday is one of the best ways for me to learn what I should be praying for and where the emphasis of my prayers should be: on requests for sanctification (becoming more like Christ). Prayer is profitable when we focus our requests and mind on things that will sanctify us, and is unprofitable when we focus our requests and mind on personal desires (e.g. spouse, baby, healing, etc). My morning and evening prayers consist primarily of written prayers with personal requests being brief (e.g. one sentence or so for each one). Doing it this way allows me to focus on what I am praying for rather than on composing my prayer. I was surprised at how much easier prayer became and how much more eager I was to do it when I removed from myself the burden of having to compose my prayers each day. Most likely any liturgical Christian tradition (probably all actually) is going to have written prayers or prayer books that they use regularly. The Anglican Book of Common Prayer is great since it contains the services of Morning and Evening prayer which can be used for personal devotion by omitting some of the parts (you can find it online here: http://commonprayer.org/offices.cfm), but will be of limited benefit if not used within the Anglican liturgical cycle (I don’t think you should use it outside the Anglican liturgical cycle). The Roman Catholic and Orthodox traditions also have prayer books available as well, just make sure that you don’t get one that is intended for use in monasteries and convents; monks and nuns have devoted their lives to prayer and can afford to do it for hours a day, everyone else cannot and is not expected to. Also be aware of prayers to Mary and other saints if you have objections to that sort of thing. So that wraps up this post. I didn’t get as far as I wanted to, but the prayer thing is pretty important and I think real instruction in prayer that is profitable is quite lacking in Evangelicalism these days. Next up is 1.15-26. This entry was posted in Acts of the Apostles, Bible and tagged Acts, Acts of the Apostles, Bible, book of Acts, Christianity, God, Jesus, religion, theology on June 26, 2013 by SRQTom. Before I get into the post let me first apologize for not have written anything recently. My absence has been due to a number of factors including being too busy write and not being inspired to write anything anyway. That being said you “should” start seeing regular entries here for the foreseeable future as I have decided to embark on a study of the Acts of the Apostles and share my insights and thoughts here. So without further ado, let’s begin. The first account I composed, Theophilus, about all that Jesus began to do and teach,2 until the day when He was taken up to heaven, after He had by the Holy Spirit given orders to the apostles whom He had chosen. The first sentence is actually quite informative for us as it gives us a clue as to the identity of the author of this book. The Gospel of Luke begins with the author saying that he is composing an orderly account of the “things accomplished among us, just as they were handed down to us by those who from the beginning were eyewitnesses and servants of the word…” The “things” referred to are the teachings and works of Jesus, as evidenced by the content that follows in the Gospel of Luke. 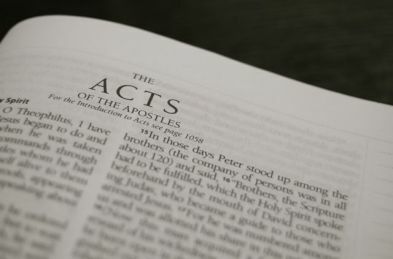 Thus since Acts begins with a statement mentioning a “first” account written to a Theophilus about the teachings and life of Jesus we can conclude that whoever wrote the Gospel of Luke also wrote the Acts of the Apostles. This is important to note as it helps us identify what the “orders” given to the apostles were. These orders the author is referring to are recorded in Luke 24.44-49, which can be summarized as the apostles being witnesses to Jesus being the Messiah that was prophesied by Moses, the prophets, and the psalms and should stay in Jerusalem until the promised Holy Spirit comes. Having already identified the author of this book being the same as the author of the Gospel of Luke we already know that Jesus said these things at the conclusion of that Gospel (for verse 5 see Luke 3.16). So why is the author repeating it for us here? I believe for 2 reasons: (1) to emphasize that this account is not separate from his first account, but rather is a continuation of it and thus should not be thought of as a separate, unrelated account; and (2) to introduce what the focal point of this account will be, the main theme if you will: the coming of the Holy Spirit and the “acts” that this event brought about. This book is all about what happened after the Holy Spirit was given to the apostles and the acts that were done through them as a result of this. The Holy Spirit will figure prominently in the rest of the book and I will be paying attention to the times when He is mentioned. Here we see reflected in the comments of the apostles the Jewish expectation, which remains until today, that when Messiah comes he will found a political kingdom and restore the nation of Israel politically. Jesus’ response indicates that this will indeed happen one day, but that the apostles should not worry about when this will happen. Instead they should wait for the coming of the Holy Spirit so that they will be empowered to be witnesses to Jesus being the Messiah the Jewish people were expecting. This concludes the author’s recounting of the end of his first account, the Gospel of Luke, and also his introduction for second account. With Jesus’ ascension the expectation now is that the Holy Spirit will come soon as it is taught in the Gospel of John in chapters 14.16 and 16.7 that unless He (Jesus) goes away the “Helper” will not come. * Jesus had already told the apostles twice (vv. 4-5, 8) to wait for the coming of the Holy Spirit and now the realization of this event is at hand. To summarize what has been said so far: the author wants us to know that this is a continuation of his first account, the Gospel of Luke, and that it will be focused on coming of the Holy Spirit and the subsequent acts the apostles performed as a result of being given Him. That concludes this post, next up will be 1.12-26. * It is my position that it was known throughout the church by the time Acts was written that if Jesus didn’t go away the Holy Spirit would not come (this is said in John’s gospel, which was probably written after Acts). The early church first taught things orally and only later were they written down. This entry was posted in Acts of the Apostles, Bible and tagged Acts, Acts of the Apostles, Bible, book of Acts, Christianity, Holy Spirit, Jesus, religion on June 22, 2013 by SRQTom.